We saw Professor Shine via controlled media releases stipulate that the mighty meat ant yet might help in the control of our cane toad though one must muse given we have had the meat ant in Australia far longer than the toad not to mention certainly since its arrival and its impact to date can only be described as minimal. We had a visit by both Senator Mechaelia Cash as well as the Honourable George Cash (Mechaelia’s father.) who both joined the K.T.B team for a toadbust and saw firsthand the impact they are having in our environment. Their media release and promise to table questions pertaining to the toad threat come the next parliament sitting should further raise awareness at a federal level whilst the Hon. George Cash’s support at a state level will help re-affirm the current governments’ commitment to our ongoing fight. A great thank-you to all parties involved in making this ‘Moriaty Bore & homestead’ busts the success it was. We also saw an increased involvement from the ‘backpacker’ demograph with Tim Leary, Jordy Groffen and I all leading field trips with various nationalities in tow. (We now have Taiwanese, Belgian, Canadian, Swiss and American Nationals adding their presence to the ever growing list of Toadbusters!) New initiatives involving set day evening busts is sure to increase the number of young ”fearless’’ toadbusters from this backpacker demograph. With the chilly arrival of our “dry season” the “grey nomad” is once again on the move and with the caravan parks beginning to fill so have the number of calls began to flood the depot phones all expressing both interest and a want to become actively involved in the fight against the cane toad. This is sure to see the number of volunteer hours increase once again for the month of May. Last but not least, K.T.B has been active in liaising with both the DEC and S.T.T.F eventually seeing Kim Hands (Stop the Toads field coordinator) join the K.T.B team toadbusting for an evening. Greater cooperation must continue if a united front is to be finally brought to the fore. Help from our greater community is much needed to couple with the highly valued and irreplaceable support shown by our local community. The cane toad’s advance is slowing; we need for it to stop. Newry once again was the focal point for many a toadbust over the month of April with Cath and Joe Atkins once again showing outstanding support for Kimberley Toadbusters by both continuing to provide two small cottages as a base for Kimberley Toadbuster volunteers not to mention provide an area where Jordy Groffen could erect his latest round of experiments on. With most areas now dry enough to drive to, the number of bores and waterholes that toadbusts have taken place has grown with that accessibility. It has also once again been noted that with mustering now in full swing toads are still able to travel supplementing their uptake of moisture through the numerous cow paddy’s that line the muster lines as herds are moved from one bore hole to the next. It has been interesting when dissecting toads taken from these ‘muster’ lines that their favourite food seems to be the dung beetle to the exclusion of all else. Whether this is through ease of ‘catch’ or some other factor yet to be determined one thing remains for sure, the cane toad continues to prove detrimental at almost every level in our environment. The long term and far reaching effects of the loss of the dung beetle are hard to imagine within pastoral communities given that they play such a vital role in being the biological tool that returns nutrient back to the soil. It was noted in one of Professor Shine’s media releases that there is a real lack of understanding on the impact of cane toads on our invertebrates and though he was referring to his observations on the meat ant I’m sure it applies here too. To date only two toads (both females!) have been removed from both Golden gate road and the northern foreshore of Lake Argyle. Their discovery sparked great concern over the possibility of breeding in the billabongs north of Matilda creek and the smaller creek systems that feed into Argyle on its northern edge. Donkey gap bore was targeted (netting a few more!) and a couple of reconnaissance trips have been undertaken by quad bike both from Matilda creek and from the end of Golden Gate road along Lake Argyles northern foreshore. It is my view that the toads caught were “explorer toads”, toads that may very well help lay down pheromone trails for the colonising toads to track upon. Needless to say there will be a continued K.T.B presence monitoring any movement of the cane toad in this area. The month of April has seen a continued K.T.B presence in this area with the first bag load of juveniles caught on its most recent toadbust. 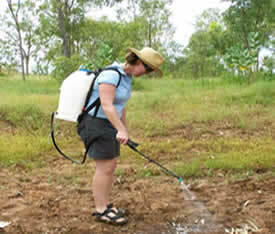 Cane toad traps have been set in this area and will couple with repeated toadbusts through the month of May. This area continues to be one of great concern particularly now cane toad juveniles have been found stipulating breeding has taken place. One positive aspect in operating in this area is that it is now easily accessible by 4wd and there is a great hope that with the continued “dry” efforts to eradicate the cane toad from this area will be successful. All located on Newry Station property, and all have been on the receiving end of repeated toadbusts through the month of March and will continue to be looked at through the month of April. Glenara bore in particular with evidence of breeding having taken place continues to be another area of concern, though once again with the continued encroachment of the “dry” it remains feasible that these “feeder” breeding areas can be cleared of cane toads before the onset of this year’s “wet”. Both of these areas have been predominantly managed by the DEC with information sharing taking place on toad numbers, catches and male/female ratios. Whilst such open collation continues to exist between both K.T.B & the D.E.C it seems silly to “double up” people on the ground. Certainly at present toad numbers seem to be minimal and whilst they remain so K.T.B’s presence will be held in reserve. Much the same philosophy has been adopted in regard to the border checkpoint between the N.T and W.A. Vigilant checkpoint officers have already ascertained areas of concern and apprehended a few itinerant toads by their call alone! It is my hope as the field coordinator for K.T.B that such cooperation will continue to prove to be beneficial to all parties involved consequently having a much greater impact on the object of all our angst in the wild. Duncan Road through to & including Rosewood Station. Various stations along the Duncan have been contacted and continue to be monitored looking at the continued spread of the cane toad. With the cooler weather now in force Toad movement seems to be slowing down with fewer toads now being caught along the Duncan. Rosewood Station on the other hand is another focal point I have listed as an area of concern. A reconnaissance trip undertaken on their property found toads as far East as Faraday Yard with isolated “explorer” toads found right through to “Blackfella creek”. We are at a tipping point here, with the watershed area starting to drain back into Lake Argyle from this point on rather than flow back into the “Baines River System” Whilst no toads have been reported at the homestead itself both Doug and Janelle have been waiting with trepidation for that moment to occur and will continue to provide whatever support they can to help stem the tide of toads. More field trips have been planned for this area in the month of May. April saw further forays behind the toad front line with both Policeman’s bore and Kildurk being hit for the first time this “dry” yielding large numbers of toads. Further work for the month of May is planned with the hope that breaking up the breeding areas will place less pressure on the colonising front slowing its movement down. Once again without the huge amount of time and effort in the field by local volunteers I am under no illusion that the numbers of toads faced in the field would be truly awesome. In the areas that are being toadbusted regularly the numbers of adult toads being found has dropped dramatically with a large part of the catch now consisting of juveniles. With such effort and energy continuing K.T.B’s aim at pushing the front line back through to Newry Station is possible. More work needs to be undertaken on Waterloo Station as well as Limbunya Station to ascertain the spread of the toads to the South. 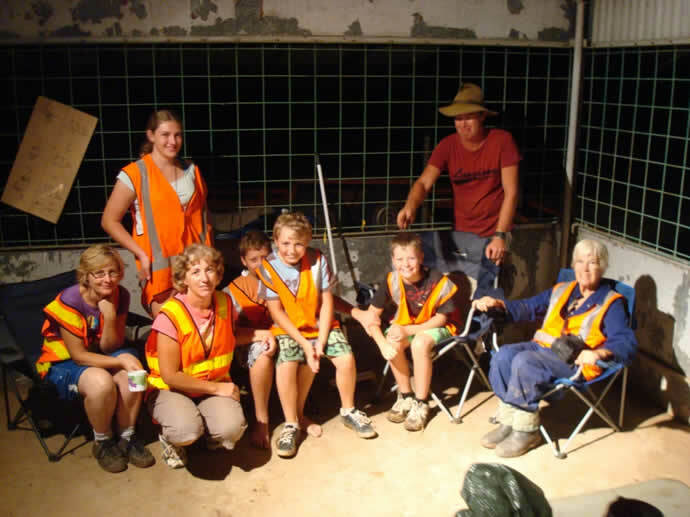 New initiatives involving Argyle Diamond mine workers as well as implementing “set” toadbusting evenings should only increase the number of volunteer hours in the field and increase K.T.B’s presence in the field. Thankfully the last four weeks has seen K.T.B turn the corner in some of the areas of concern. Adult populations throughout Newry Station are on the decline with numbers of juveniles caught dropping now too. Great thanks this month to Tim, Scotty & Clare who have tirelessly worked at reducing toad populations every weekend not to mention the odd day in the middle of the week too! The ball also seems to be rolling within the backpacker community with one Saturday night toad bust recently seeing 24 individuals from 12 different nationalities join the fight. Given the positive reaction from a vast majority of our international visitors I can only see this number continue to grow further as more visitors roll into town. The last four weeks also saw our lung worm scientist Jordy Groffen conclude this year’s round of experiments and head back home to Holland. He will be greatly missed as he was an absolute boon to have not just around the KTB depot but out in the field also. His summary of the work he completed was presented at a public forum the night before his departure, but if any one missed it I am more than happy to provide a hard copy for their reference. I am assured that he is already finding further ways to get back over to Australia with some exciting side lines having arisen from research already concluded. Several major 4 W/D, quad bike and helicopter reconnaissance trips into new areas have been undertaken focussing on areas to the south between the Buntine Highway and the Victoria Highway. Every effort is being made to try and determine how far to the south the spread of the toad is and at present the southern-most front line appears to be around the catchment area for the West Baines. Having Nicholson Station as a base for future toad busts along the southern end of the Duncan highway can only be a boon in the tough times to come ensuring a strong KTB presence in that neck of the woods when the toads start moving again this wet season. KTB saw the new addition of Ruth Duncan to the team. Ruth will be finishing and broadening the work started by our previous biodiversity officer, Katrina Nelson. Ruth also put together a wonderful power point presentation for the public forum listing the positive reasons why it is so important to have good base line data and why it’s so important for the programme “what’s in your backyard?” to be implemented here in Kununurra before we get hit by our first wave of toads. It is encouraging to note that Graham Sawyer of ‘frogwatch’ fame has started his own program for Darwin residents called “NIMBY” or “Not in my backyard”. Good ideas do have a way of catching. Once again KTB has liaised with the DEC, National Parks and Wildlife and station land holders and managers in an effort to have a united front against the cane toad. I’m happy to say that whilst there have been the odd hiccup as the month passed, all in all every party involved has been operating from the same page in the book, with all seeking the same outcomes although at times utilizing different methodologies. When we are all looking at such a huge area of ground, it’s good to know that there is more than the one organization involved and having those parties exchange information can only help lighten the load. Three reconnaissance forays down golden gate road and along the Northern foreshore of Lake Argyle have been undertaken this month both yielding a ‘No Toad’ result, thank heavens! Interestingly, we did come across two feral cats diversifying KTB’s role a little in their removal. KTB will continue to survey the Golden gate road/Thompson springs/Northern foreshore over the dry period and traps will be placed in strategic positions and used as additional monitoring stations. Four large female toads have been pulled out of Donkey gap bore in the last month and to date there has been no evidence of breeding. It is through this point that KTB believe toads accessed the northern foreshore of Lake Argyle. This area will continue to be monitored very closely over the next couple of months. Matilda creek is also an area of on-going concern with a fairly large number of juveniles still being taken out of the billabong systems to the north of Matilda creek near where the mouth meets Lake Argyle. It does mean that breeding early in the year was unfortunately missed and the large task of keeping the foreshore clear of toads that much more difficult. This emphasises the importance of making sure that tadpoles and metamorph incursions are dealt with before they reach the juvenile stage and start moving on. Both Glenarra and Moriaty bores are found on Newry Station property with great thanks once again going to Newry’s managers Cath and Joe Atkins for their continued support in allowing Kimberley Toad Busters use of the two cottages on the property as well as access to any area where there is toad movement. These two bores have been hit hard over the past 4 weeks with six visits by various team leaders all recording the same information; a marked decrease in the number of adult toads bagged as well as a decrease in the number of juveniles (3 large adult females at 15cm or over and 22 individuals between 7 and 10cm’s which is a massive reduction on the 465 large adults caught in March on one evening!) As long as there continues to be such a drastic reduction in toad numbers in these “feeder systems” there remains the distinct possibility that we will clear these areas entirely of toads before the next wet season. Regular weekly toad busts have occurred in and around the homestead and the number of toads being caught is still relatively high. The only marked difference is the number of adult toads caught is decreasing. Numbers of toads being caught are still high to the south of the Newry Station driveway. It is my hope that numbers along this part of the Keep can be held at least in check with repeated toad busts along its banks, and that further work in the turkey nests, bores and dams to the East of the Keep River will start to have a stabilizing effect on numbers still flowing into it. In the month of June we will start to see some of the more beneficial flow on effects now KTB is starting to toad bust ‘feeder’ systems behind the front lines. Two toad busts occurred out on Kings Billabong over the month of May, the longest a week in the field by one of our stalwart toad busters “Wally” with a tally of just under three thousand toads for his efforts! Jordy and I also spent a night at Kings Billabong a few days after his visit yielding a total of 49 toads (and that took us most of the night!). This is a real indication of the fantastic effort Wally made. Another positive bit of news is that over 50% of the toads dissected from Kings Billabong where infected with the lung worm parasite! There have been a number of reconnaissance trips run undertaken over the last 4 weeks with the objective of looking at the spread of the lung worm parasite. Encouraging results show that the parasite is quickly spreading within cane toad populations. Another encouraging point tabled by Professor Rick Shine was that even one parasite can have a detrimental effect on a toad when it is placed under stress (Toad busting is a GREAT way of putting our toads under stress!) Areas covered were the Old Humbert River Station, Victoria River Downs Station, Top Springs and Wave Hill. In these five areas the lungworm parasite has been found with infection rates as high as 66% in the Humbert! Further reconnaissance trips through Limbunya and Old Kildurk have been undertaken from KTB’s southern depot at Nicholson Station by Lee Scott-Virtue and Dean Goodgame all yielding a “No Toad” verdicts! Last but not least, an overnight helicopter trip was undertaken by John Cugley and Jordy Groffen in Gregory National Park at Broad Arrow Creek. It was once again looking specifically at the spread of the lung worm parasite and what kind of density of infection in the toad population there. Certainly if anyone is interested in the results or for that matter in any of the areas field trips have been undertaken please contact me via e-mail and I can send you the information reconnoitred. Community spirit after the shock of hearing toads have crossed our Western Australian border seems to be again on the rise as is the old community ‘can do’ attitude. Without the huge amount of volunteer time and effort our fight against the cane toad would be a fore gone conclusion long ago. Your help matters and does make a difference and this is seen time and time again in the areas that toads are busted regularly. Toad busting is unlike any occupation I know out there. Given it is so unique, it has its own conundrums, its own highs and its own lows. With the toad advancing with this late bit of weather it is the 'low' as field coordinator that I am experiencing. KTB (and I in my role as Field Coordinator) had hoped that ‘we’ the community would be able to keep 'all' toads out of Kununurra for at least this 'dry'. Obviously this has not been the case with some twenty four toads being picked up in and around the outskirts of Kununurra. Whilst these field results are certainly disheartening it is important to realise that these are the 'explorer' toads and NOT the colising frontline. They certainly are the precursor for the 'colonising' wave, but KTB still feel confident that with we will be able to ‘clear’ Kununurra of toads and enjoy another dry season without toads before the ‘real’ fight begins. A 'Brief' on toad movement. “A Cane toad ‘Corridor’ may signify colonising toad movement through several aquatic or terrestrial systems. ‘Signatures’ of this movement can be recognised by a predominantly male toad population and evidence of subsequent breeding”. Ben Scott-Virtue. KTB Field Coordinator. “Explorer Toads. It has long been recognised by KTB that ‘travellers’ or ‘esplorer’ toads move ahead of the colonising front. Future research needs to focus on ‘the why? Ben Scott-Virtue. KTB Field Coordinator. To give a brief update on where toads are, we need to understand just what constitutes a cane toad colonising ‘front line’ verses ‘explorer’ toads moving ahead of the ‘colony’. “It is clear from KTB that there is little understanding from Scientists or government on cane toad behavior and what drives them to continue their westward march. This lack of understanding by scientists and government only reinforces that there has been no real research into toad impact on invertebrate species-the building blocks of biodiversity”. Ruth Duncan. KTB Biodiversity Coordinator. This northern most corridor of cane toads has moved approximately 45 kilometers over the wet season, (primarily because KTB have not been able to access this area other than by helicopter). Toad busting has been minimal and as a result of this toads have been able to breed (and establish) as well as move forward. The WA/NT Northern Corridor of toad movement specifically relates to Legune Station area and North the esterly direction of toads moving towards WA and Kununurra. Recent field work by KTB can confirm that toads are at 'Sorbys' and only one kilometer from Cave Springs and are rife through to the mouth of Keep River. KTB’s have attempted to access this area several times during the ‘wet’ however KTB efforts to access the cane toad threatened area through 'Martins Gap' indicates it will be at least a few more weeks before we can confirm the toad situation in this area. This also means that KTB will not be able to undertake their “What’s in your Backyard?” comprehensive Biodiversity survey in these areas for some weeks. WA/NT 'Eastern’ most Cane Toad Corridor’s' to cross into WA. In the 'Eastern corridor' toads have moved Westward roughly 15 to 20km. The ‘eastern’ corridor of toad movement is primarily through the Keep River north and south, Matilda and Hicks creek into the Eastern shores of Argyle, and through to Rosewood, via Stockade Creek, Faradays and Gum Tree Creek spreading to the South to Waterloo Station. KTB have been able to continue daily toad busting in these areas throughout the wet season. It is clear that community effort in not only taking out mature toads but also working on ‘breeding’ outbursts has assisted in slowing down this Victoria Highway corridor. 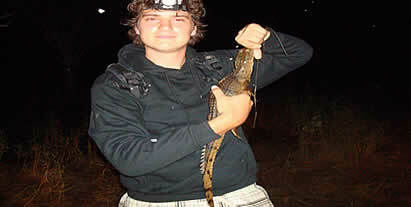 Recent research work undertaken by KTB and East Kimberley Tours sponsored researcher Jordy Groffen on the Lungworm Parasite has indicated that cane toad corridors not regularly busted by KTB has seen a dramatic movement of this lungworm. The main Victoria Highway Corridor on the other hand has seen a reduced recording of the lungworm Parasite. While it is clear that the Lungworm still offers the most positive biological answer we still do not know just what this impact means ( this is despite the Federal Governments funding of research of this area of research to Sydney University over the last several decades). Jordy Groffen, the sponsored Dutch student has, or the past three years determined new insights into the Australian Lungworm research program. The results of this research has been made available on KTB literature and press releases and it has been interesting to note the ‘flurry’ of ‘peer’ reviewed papers on these results with no credit being given to KTB or to Jordy Groffen. KTB will continue to fund the Lungworm research project from hard earned funds. At present the Central 'Newry Station to Rose ward Station/Lake Argyle/Victoria Highway corridor wave' of colonising toads crossing into WA has reached Golden Gate road. Toad numbers in the last week (a result of recent rains) has resulted in a toad haul of around 300 mature toads. Breeding (for the first time) has now been found within WA along the Northern foreshore of Lake Argyle. KTB have ascertained from field work that the main colonising front is still just west of the Lake Argyle road. Current field results indicate that the breeding expected in these areas has not been found. This would confirm that community efforts n the removal of adult toads as well as reducing breeding does have an impact. WA/NT 'Southern’ most Cane Toad Corridor to cross the WA border. KTB surveillance of the Southern 'front' has estimated that this front has moved by far the most with an estimated distance of some 65km covered by the toad. Access by KTB to this area has been difficult, despite a base at Nicholson Station. It is this inability for KTB to reach these areas by vehicle during the wet season that has made it impossible to Reconnaissance trips from Nicholson to take place. Toads are now just east of Limbunya Station. Nicholson has responded to Cane toad alerts from Ringers Soak. This is the front coming in from Gregory National Park to 'Soda Creek' and into 'Black Gin Creek'. Toads have hit Limbunya Station and KTB have picked up toads only 15km from the Buntine Highway on the Limbunya track. To the East of Limbunya there is a series of yards about 30km from the homestead that have (well, had...)a large population of toads, this only puts the toad about 70km as the crow flies to Nicholson. Toads are well and truly established within Kalkaringi and are rampant in the 'Vic'. It will not be long before the toads move into Inverway and Bunda Stations flowing down 'Sturt Creek' into Lake Gregory. IKTB are assuming that the reason the toads have moved so quickly down this Southern Corridor is because there has been limited toad busting activity in this region due to limited wet season access. Indigenous Partnerships. Following up from last years 'Ranger' success, Will, Sam and Phillip from the KLC set about organising crew for 'toadbusting' activities. The word must be out because we doubled the number of individuals placed out in the field for the week to 40. We had our normal Derby, Mullum and Bayulu crew complimented by new rangers from Beagle Bay and Warmun. We also had a representation from Wyndham, Kalumbaru and Kununurra. In terms of 'local' indigenous community input, I am happy to say that we can enter Ben Wards land out at Cockatoo Springs, and also can access Mertle and Ruthy's Land out at Gerrulungereng. Nelson Springs and Aminbidji are another couple of communities that K.T.B is now working with on a regular basis. Ringers Soak is another aboriginal community that K.T.B has visited and is welcome back at any time for toadbusting activities..
Pastoral Partnerships. Access to land is extremely important if we hold any hope of keeping the toad some what in check. I am happy to announce that we are welcome visitors on Rosewood, Newry, Legune, Limbunya, Inverway, Bunda, Ord River and Auvergne Stations. There are a few more Stations well behind the lines that also grant access (VRD and Coolibah spring to mind) though through both limited resource and more pressing concerns closer to home will end up being a little neglected as the year flows on. It must be noted that there are new managers out on Newry Station, with Cath and Joe taking up an offer of managing the cattle yards in Wyndham. Tom and his family, previously of Humbert River Station, now are looking after the place with K.T.B looking to build on an already firm relationship. Community. With now a little over five thousand volunteers now on the K.T.B books there has been a huge ground swell of support in trying to keep toads out of Kununurra. Without a doubt the huge amount of media coverage on the toad issue has kept 'toads' in the forefront of 'local' minds. It has been extremely heartening to have individuals call the K.T.B with questions surrounding identification and safe methods of euthanasia, not to mention have the many individuals put in volunteer time 'toadbusting'. The community at large continues to play an absolutely vital role in keeping the toad in check and for the foreseeable future continues to remain the beating heart of Kimberley Toadbusters. Overseas volunteers. Last year I started a push to involve overseas visitors in toadbusting activities through my connections within the 'backpacker' industry. This was extremely successful easing some of the pressure felt within the 'local' community who five years down the track were feeling a little 'worn out'. In one week alone there were 27 nationalities out in the field, a feat I hope to be able to raise as the season progresses. Certainly, as K.T.B continues to grow in all sorts of other areas participation by overseas guests in toadbusting will continue to grow too. Reconnaissance. As with all field based activity, there is always a need for good reconnaissance and with any reconnaissance there needs to be talented individuals on the ground able to be sent into an area previously unknown. Fortunately with John Cugley now in the position of Administrative coordinator, new depth and electronic skill has been added to reconnaissance activities, enabling K.T.B to have even greater 'reach' along the toad front. Media coverage. The last six months have seen numerous T.V, radio and feature articles written about K.T.B. Most are after stories from the field relating to the spread of the toad. I have worked with Alex from the ABC, Xavier from WIN T.V and channel nine. Living Black was in Kununurra and joined the K.T.B team in the field and Vanessa Mills conducted live ABC radio interviews on a range of toad related activities. Feature articles appeared with regularity in our local paper, the Kimberley Echo and Fluer Banger has a feature article coming out in Australian Traveller pushing K.T.B's profile even higher. In short, the last six months have been a busy six months. Field operations while tapering off a touch over the 'wet' still saw someone out almost every night. Certainly with the 'dry' approaching the number of phone calls we are receiving by interested potential toadbusters is on the rise as are the number of phone calls we are receiving for toad identification. Both are great indications that the 'word' is certainly out there. Another important point to consider is the impact that 'toadbusting' activities are having. With the Northern corridor having moved a minimum of 45km and the Southern Corridor a full 65km, when we look at the Eastern/Newry corridor and the movement of the colonising front making only a 15-20km push forwards it is easy to see that combined community effort really has slowed the toad. It is these small victories that help keep me focussed on the tasks at hand!